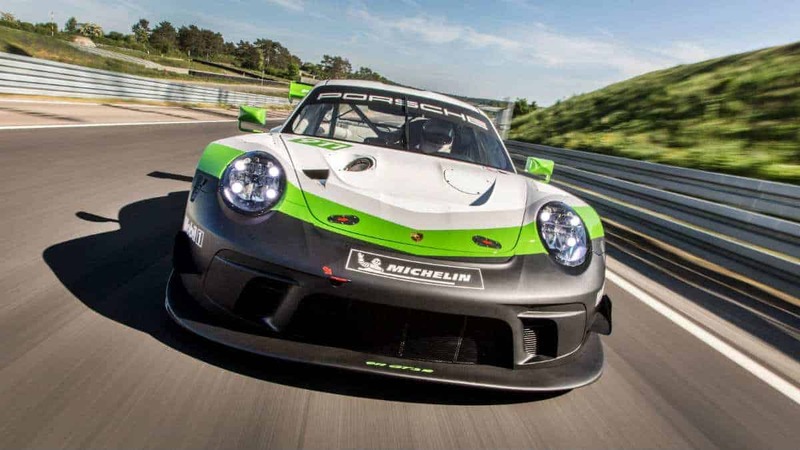 Porsche has designed a new customer racer for GT3 series worldwide based on the 911 GT3 RS production sports car – the Porsche 911 GT3 R. During the development of the up to 404 kW (550 hp) racing nine-eleven, special attention was paid to particularly efficient aerodynamics, further optimised safety as well as lowering the cost of servicing and spare parts. 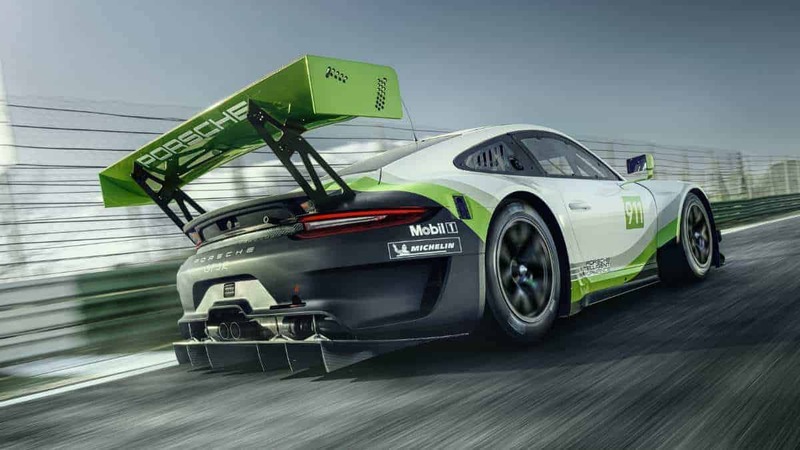 The lightweight body design of the 911 GT3 RS production sports car featuring intelligent aluminum-steel composite construction has proven to be the ideal basis for the near-production race car. The roof, front hood and fairing, wheel arches, doors, side and tail sections as well as the rear lid and interior trim are made of a particularly light carbon-fiber composite material (CFRP). All windows consist of polycarbonate. 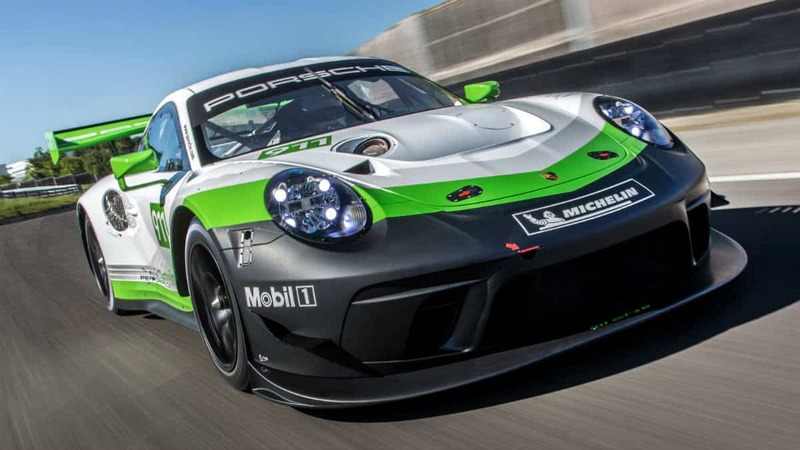 Powering the new 911 GT3 R is a cutting-edge four-liter flat-six unit which is largely identical to the high-performance production engine of the road-legal 911 GT3 RS. Direct fuel injection, which operates at pressures up to 200 bar, as well as variable valve timing adjustments of the intake and exhaust camshafts ensure a particularly efficient use of fuel. Moreover, compared to its predecessor, the normally-aspirated engine offers significantly better driveability and a broader usable rev range. The engine response is more precise due to six throttle butterflies. Power from the rear engine is transferred to the 310-mm-wide rear wheels via a Porsche sequential six-speed constant-mesh gearbox with an electronic shift actuator for, particularly fast and precise gear changes. As in the GT road-going models, the driver changes gears via shift paddles conveniently positioned on the steering wheel. The clutch is electrohydraulically controlled, which eliminates the need for the clutch pedal and assists quick race starts. Typical of the 911, the weight distribution ensures excellent traction and braking performances. 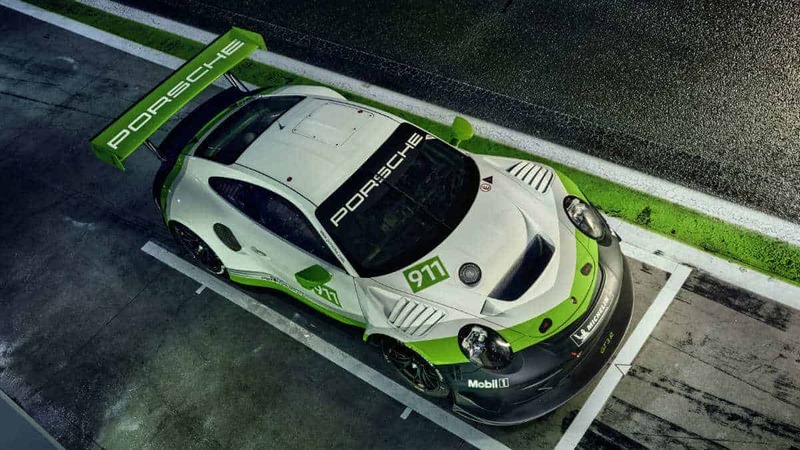 The spectacular aerodynamics of the 911 GT3 R also follows the example of the road car. The distinctive wheel arch air vents on the front fairings increase downforce at the front axle. Measuring 1,900 millimeters in width by 400 millimeters in depth, the rear wing lends aerodynamic balance. The tire circumference at the front axle has grown from 650 to 680 millimeters. In tandem with the new Porsche double wishbone suspension, this ensures superior braking performances and consistency over the duration of the race. 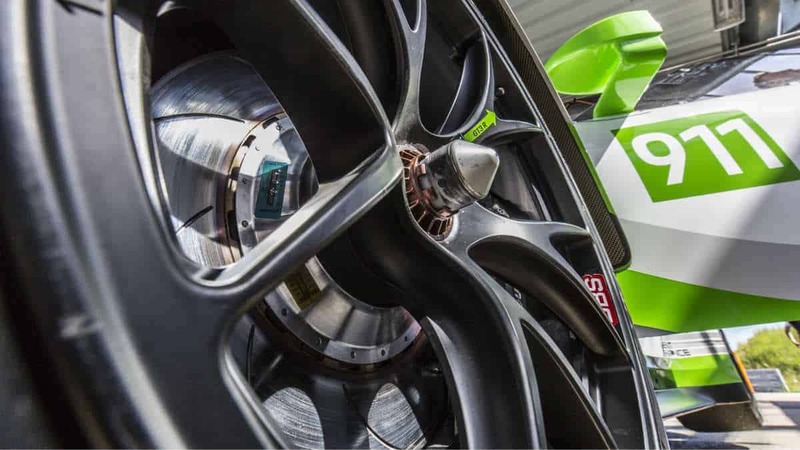 The brake system of the 911 GT3 R also underwent further modifications and now offers increased stiffness and more precise control of the ABS. At the front axle, six-piston aluminum monobloc racing brake calipers combined with ventilated and grooved steel brake discs with a diameter of 390 millimeters ensure outstanding braking performances. Fitted at the rear axle are four-piston calipers and discs measuring 370 millimeters. 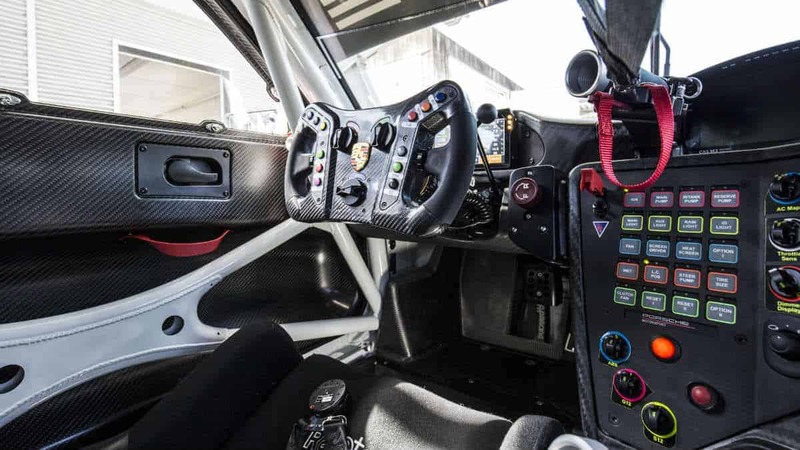 Another development focus was on the safety features of the 911 GT3 R. In order to improve pit stop performance, the 120-liter FT3 safety fuel cell can now be refilled from the left or the right depending on the circuit layout. The doors and the side windows can be removed. The new racing bucket seat affords pilots even better protection in the event of a collision. The seats are now bolted at six points. In combination with the adjustable pedal box, the driver’s center of gravity is optimized and offers increased safety in the event of an impact. In addition, the driver is protected thanks to a side impact element positioned in the driver’s door, which consists of carbon fibre Kevlar aluminium construction with energy-absorbing plastic foam.